“Modern technology could not do without materials that have clearly defined physical properties. A new approach to achieving targeted and at the same time reversible material design using oxygen has now been presented by scientists at Forschungszentrum Jülich. The ceramic material they examined is able to absorb, store and release oxygen, in the same manner as a sponge does with water. In the process, the crystalline substance switches from conductive to insulating behaviour, while at the same time its magnetic properties also change. The researchers envisage possible applications for this material in data storage, sensors and catalysts. Lanthanum strontium manganite, (La,Sr)MnO3, also known as LSMO, is a so-called oxide ceramic material already used in high temperature fuel cells. Before the Jülich researchers began with their experimental work, it was already known that the material’s electrical conductivity is influenced by the uptake of oxygen. 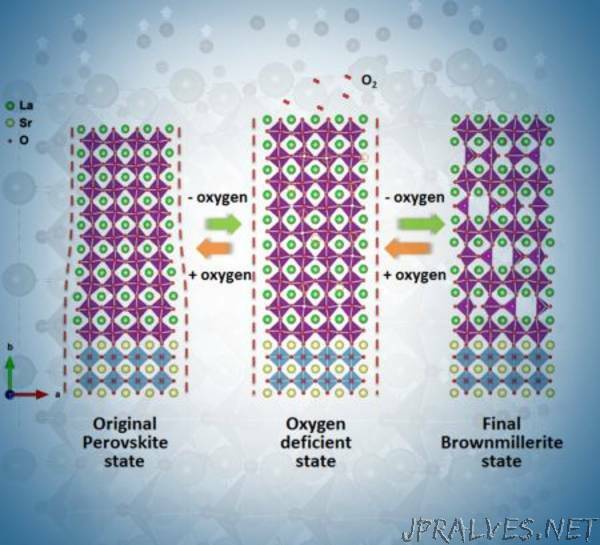 However, they were able for the first time to track, step by step, the changes in the crystal structure and its magnetic properties accompanying the absorption and release of oxygen. In this way they could establish a basis for better material design. Unlike so-called “doping”, used to modulate the electrical conductivity of semiconductors, the process is reversible: the oxygen content can be changed repeatedly by e.g. applying heat. “This opens up fascinating opportunities to modify the properties of a technically interesting material”, explains Dr. Oleg Petracic, physicist at the Jülich Centre for Neutron Science (JCNS).